Question the people who want your votes! Sneinton Alchemy is hosting your chance to quiz, face-to-face, the 2015 election candidates who want to become your Nottingham East MP. View of the Hustings in Covent Garden, James Gillray 1806. National Maritime Museums Collection. Hustings are events that put the candidates up in front of the people whose votes they are seeking, in a public setting. They give a chance for voters to see how the candidates answer unexpected questions, and how they relate to the each other and the voters themselves. They are often seen as a chance to put candidates 'on the spot' and get an insight into their characters, beyond the glossy election leaflets. As the election fever heats up and we get closer to the General Election on May 7 you might have a question for representatives of the parties seeking your vote. This is your chance to put your questions to them and listen to their responses. 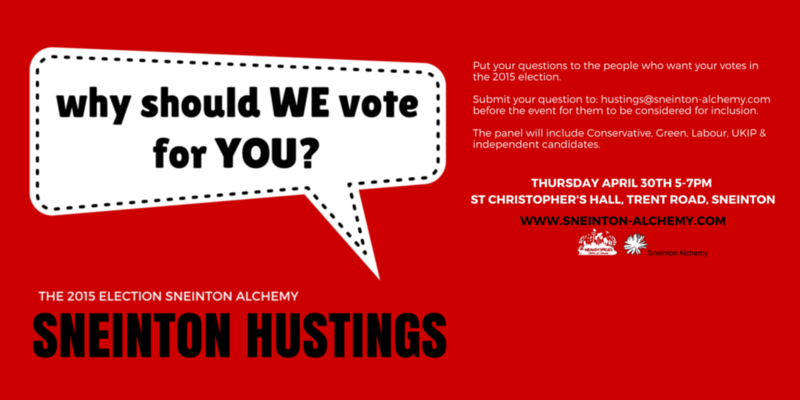 Sneinton Alchemy hosts the debate featuring candidates of four parties seeking to win your vote in the General Election campaign, ahead of the poll on May 7. Taking part are (parliamentary candidates unless otherwise stated): Garry Hickton (Con), Fran Loi (UKIP), Antonia Zenkevitch (Green), David Mellen* (Lab), Seb Soar (Ind) and James Stephenson (Ind). *David Mellen is a Dales Ward Councillor standing for election as an MP in the Rushcliffe constituency. Where: Growing Spaces, St Christophers Church Hall, Trent Road, Sneinton. See map below. Who do you think is going to come across best? put your question into one of the boxes marked “Sneinton Election Debate Hustings 2015” which will be placed in the reception at the Sneinton Library, the Greenway Centre, BANCA, Muslim Community Organisation and the STOP Café. See the event listing on meetyournextmp.com, where you can also upload comments.